SOME say the Spanish Prime Minister is out of touch and has taken his finger off the pulse. But Mariano Rajoy proved doubters wrong by getting his priorities straight in the run up to the most exciting general election in Spanish history. While the other party leaders engaged in a crucial TV debate last night, the PP boss was preoccupied with the more important matter of… what’s happening in Andalucia. And his choice of reading matter was spot on! 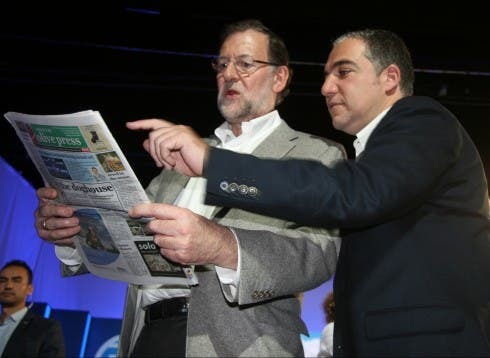 After a keynote campaign speech for party faithful in Estepona, he found time to catch up on expat news by reading your very own, decade-old, super-reliable Olive Press. While debate still rages about his ability to speak English, he was clearly engrossed in our last front page, before spending a minute flicking through the issue. Finding plenty of interest, with Malaga’s PP boss Elias Bendodo looking over his shoulder, he then pointed out something apparently intriguing on the cover. Perhaps he was making a note of the website for future reference on his return to Madrid? Or maybe, just maybe, he was imagining himself pictured on the cover of our next edition following a landslide victory on December 20. Dreams can come true. I hope one of my letters was printed in this edition! I think it’s pretty much a given, Jane. Damn guiris… They moan when I demolish their houses. They moan when I DON’T demolish a hotel! Are they never content?! Print copies are widely available across Andalucia – and you read it online at https://www.theolivepress.es/print-edition/ wherever you are in the world!